There are many causes for a cat eye infection, some temporary and others chronic. Symptoms include squinting, swelling, redness, discharge from the eyes yellow, clear, or green in color, a cloudy iris, or the cat pawing at his eyes. What can be done when it seems there is a cat eye infection? Treatment depends mostly on the underlying cause. 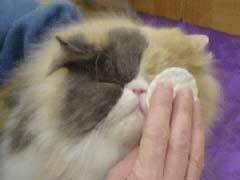 While home remedies are possible, any cat eye infection home remedy should be discussed with a veterinarian first. Feline conjunctivitis, more commonly known as pink eye, is a more common cause for cat eye discharge and swelling. When it is brought on by mechanical or chemical irritants it is often temporary. This results from foreign particles or chemicals in the eye, or from injury from fights. This form of conjunctivitis in cats is usually treated with ointments or drops that must be administered multiple times a day. However, there are many immune based conditions that can come with cat eye infection. Kittens are often vaccinated for feline Herpes virus 1, though obviously strays would not be. This particular form of conjunctivitis is incurable, but still treatable. In this case, home remedies may lessen symptoms. In order to treat cat eye infection at home, mix a saline solution of ¼ teaspoon salt and 1 cup water. Gently drip a few drops into the affected eye 3 to 4 times daily. There are also herbal supplements which can lessen symptoms, such as burdock, rosemary, or meadowsweet. If symptoms of infection persist, contact your veterinarian to ensure it is not a more serious condition.